The three sets of doors at the main entry feature mirrored pairs of his signature "H. A." door design. A large section of the area surrounding the entry appears to be glass. Planting is indicated symmetrically at each wide of the raised entry. The reflecting pools of the final design are absent. The concept for a central peaked roof is indicate with a cone resting above an elliptical drum. The form recalls Etruscan tumuli from the pre-Roman era. That the height of the roof was a critical factor in the design is suggested by the revisions to the building height. The apparent symmetry of the exterior seems absolute. The reason that this design was set aside in favor of a square shaped plan with a taller spire is not clear. There may have been concerns regarding cost, symbolism, and practicality. 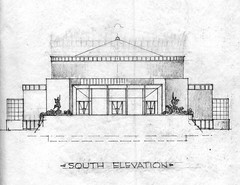 Drawing courtesy of the Harris Armstrong Archives, Special Collections, Washington University in Saint Louis.